A minimalistic puzzle game with 9 levels. I prefer to see everything in cycles. However time is a constant going forward permanently. But we try to measure time via the inconsistent rotations of our planet on our regular clocks. And the years are measured with the help of the earth's rotations around the sun. 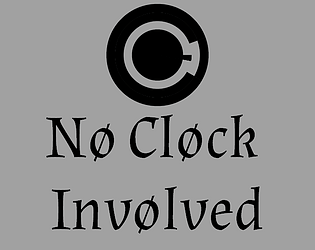 So 'No Clock Involved' tries to let the player give some scenarios where he can play as time and manipulating its surroundings in some puzzles. Sometimes the player has to do additional cycles while other times he has to go back in time. Rarely the main color black turns instantly to white. The puzzles were interesting, and the overall game relaxing. However, I think the flipping mechanic would've been better if the color change was less drastic. It doesn't cover that the field is flipping any better by inverting the colors, and it makes the use of that mechanic in solving unpleasant. Also, the pushing of objects and their sizes was awkward in some levels. I think if the rotations had snapping movement like the vertical movement did, it would've helped both with pushing items and with not taking so long to make a full revolution. I actually was thinking about smoothing the inversion to something less drastic, but ultimately decided against it, as had some problems regarding user experience with it. In other words: Without a snappy change I couldn't pulled off the inversion as I did now during the jam session time.